January 14, 2018 at 10:49 pm. MINNEAPOLIS — Kyle Rudolph had showered and dressed after the Minnesota Vikings’ improbable walkoff victory on Sunday against the New Orleans Saints, and was ready to put the first playoff victory of his career into perspective. 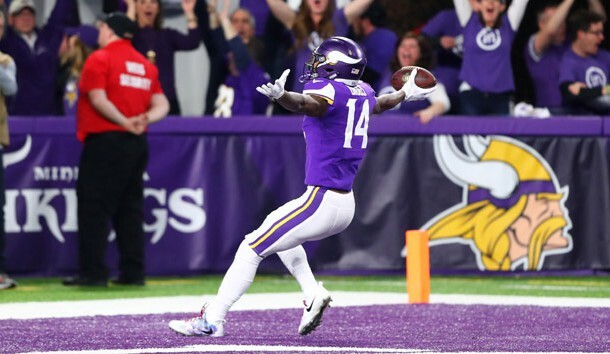 Rudolph, the longest-tenured member of Minnesota’s offense, had watched quarterback Case Keenum throw the ball up and receiver Stefon Diggs make a leaping catch before spinning and staying inbounds on his way to a game-winning, 61-yard touchdown in the Vikings’ 29-24 win. The most unlikely of endings ignited one of the unluckiest of franchises. Forget the four Super Bowl losses. Those are ancient past. No, the fan base had been through plenty in recent years to consider themselves cursed. It was Gary Anderson’s miss in the NFC Championship Game that kept the 15-1 Vikings from reaching the Super Bowl after the 1998 season. There was the 41-donut two years later in the NFC Championship loss to the New York Giants. Another expected Super Bowl run in 2009 was derailed at the hands of Sunday’s opponents, the New Orleans Saints, when Brett Favre was intercepted and Minnesota lost in overtime. Just two years ago, Blair Walsh’s chip-shot, 27-yard field goal sailed left with 26 seconds left in a 10-9 loss to Seattle. Rudolph continued, listing off the bad breaks for the Vikings like losing quarterback Sam Bradford after he was NFC Offensive Player of the Week in Week 1 against New Orleans and impressive rookie running back Dalvin Cook suffering a season-ending knee injury in Week 4 as Minnesota fell to 2-2. With one catch and run, the Vikings hope to have exorcised any playoff demons. There was seven seconds on the clock when Keenum let the ball go. Diggs went high to make the catch and safety Marcus Williams went low and missed a hit on Diggs, perhaps trying to avoid a penalty. Diggs landed, turned and had no one between him and the purple of the end zone. He did a high-wire balancing act along the sideline to stay in bounds and celebrated in the end zone with no time left on the clock. There is no curse, but these Vikings are living a charmed life. Previously a journeyman, Keenum took over for Bradford and had an MVP-quality season. There’s nothing lucky about one of the league’s best defenses, even though it received its own fortunate turn on Sunday. Defensive end Everson Griffen had his back to quarterback Drew Brees and simply threw up his hand. He tipped a Brees pass and linebacker Anthony Barr was there to make the interception. “It’s about time” was echoed by several players after the game. Minnesota Pro-Bowl receiver Adam Thielen had lived through all of the recent playoff letdowns as a boy growing up in Detroit Lakes, Minn. Even as Diggs celebrated, other players and coaches were hesitant. The crowd was frenzied. But everyone looked toward the field to see if there was a penalty on the play. Not this time, not for these Vikings.